If your self-test looks like the example below, the result is negative. 1 line appears: the control line. This line may be light or dark. If your result is negative, it is important to ensure that you are not in the window period (seroconversion*) and to consult a doctor. If you think you may have been exposed to HIV in the last 3 months, you cannot be certain about being HIV-negative at this time. 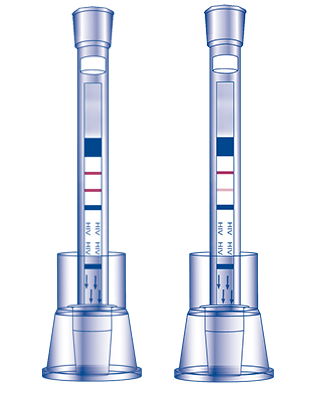 You will need to redo the self-test once 3 months have passed since your most recent risk of exposure to HIV. 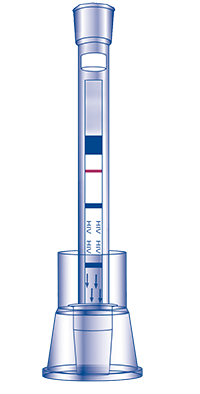 *Seroconversion refers to the period of time required for HIV antibodies to develop in sufficient quantity to become detectable. If your self-test looks like one of the examples below, the result is positive. 2 lines appear: the control line and the test line. Either of the lines may be lighter or darker than the other. 1. CONSULT A DOCTOR, as soon as possible, and inform him/her that you have just done a self-test for HIV and that your result was positive. 2. YOUR SELF-TEST RESULT MUST BE VERIFIED BY HAVING A CONFIRMATORY LAB TEST. 3. PROTECT YOURSELF and PROTECT OTHERS. Avoid any activity that could transmit HIV to others until you have received the results of your confirmatory test.